This blog series and the tests reported herein is designed to show some of the key differences between Autodesk Inventor Professional 2011 and SolidWorks Premium 2011 for digital prototyping workflows. This final part of our 8 part blog series examines Mechatronics – the ability to perform cable and harness design in an existing design from an imported electrical wiring diagram. We test the ability of the mechanical CAD system (MCAD) to leverage data from an electrical CAD system (ECAD). The ECAD system specifies the appropriate connectors, wires, and their connection points while the MCAD system specifies the physical location of those wires and connectors within a product. 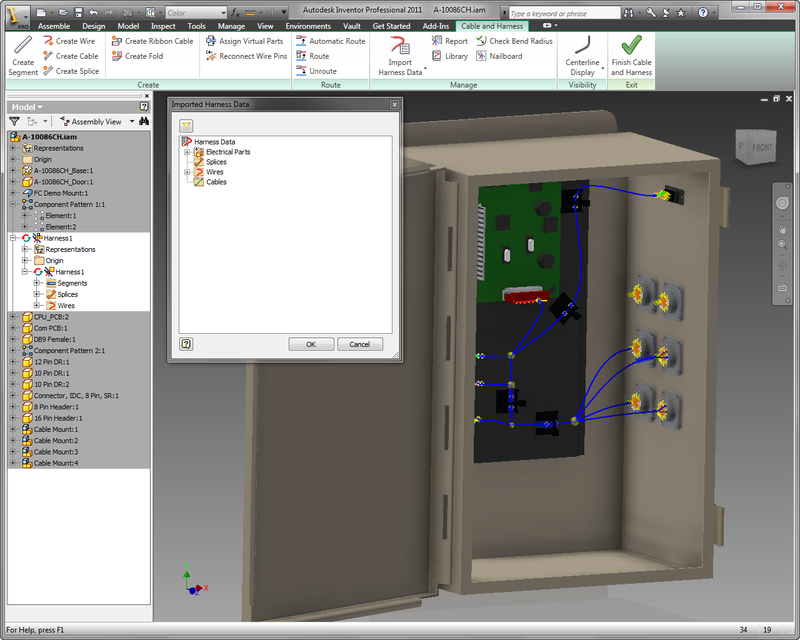 Autodesk supplied an Inventor video of their solution, a net list in Excel format, a STEP file of the enclosure assembly, and a schematic drawing (.dwg) of the connections. Leverage the data stored in schematic drawing files to design wire harnesses in the mechanical system. Such data can be stored exported from an electrical design file using various techniques. At its most basic, the electrical design software sends a net list to the mechanical package containing connector information for each wire, wire types, and a list of pin-to-pin connections. Not tested were two-way associativity between the electrical and mechanical software, nor were any tests designed to simulate electromechanical interconnections such as activating switches or sensors based on mechanical actions. 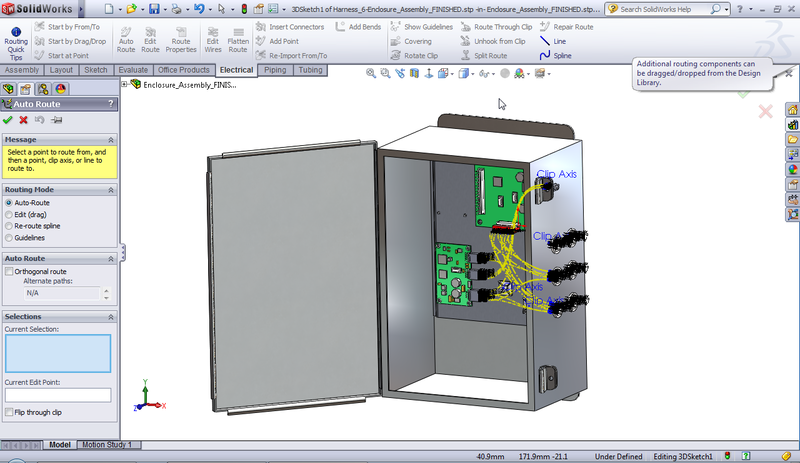 Autodesk supplied us with an Inventor video of their solution, a net list in Excel format, a STEP file of the enclosure assembly, and a schematic drawing (.dwg) of the connections. The two software packages (Inventor and SolidWorks) are comparable. Inventor has a tight connection to AutoCAD Electrical with the xml file transfer. SolidWorks has similar tight coupling with some third party software such as Zuken’s E3. Both systems use added cost electrical software to generate the net-list. SolidWorks was not able to read the AutoCAD Electrical generated xml list, and instead used an Excel file with similar data that needed manual cleanup in Excel. It appears that there are a few more interactions with SolidWorks, but this may be due to the operator-preferred method. Both systems effectively produced the required output. There appears to be no real operational advantage to either package when used with tightly integrated electrical schematics software. Since AutoCAD Electrical is one of the most widely used electrical schematic packages, the advantage goes to Inventor. For this test, on the AutoCAD side, AutoCAD Electrical exports an XML file to Inventor. Inventor reads this file and generates the 3D wiring and, under user control, assigns wires to cables. It can then generates wire lengths, a flat wire harness diagram and a pin board for manufacturing. 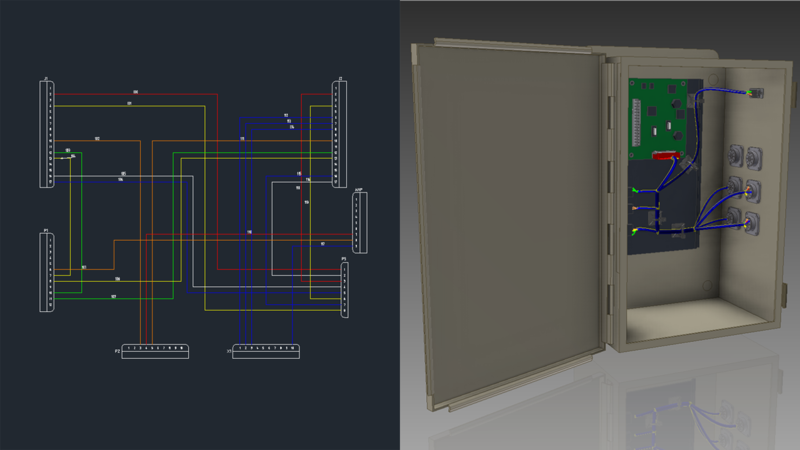 Inventor opens the 3D model and then the xml file of the net-list from AutoCAD Electrical. This designates the pin-to-pin connections where the wires are to be placed. Different than SolidWorks, the Inventor user placed the harnesses in anticipation of the wiring to be imported. The wire import could also have been done first, as seen in the SolidWorks video. The names of the connectors and the number of pins on each connector are stored in coordinated libraries in both the electrical and mechanical systems. After the import, the imported wires appear as direct point-to-point connections between the pins without using any harnesses. 19 wires were imported and identified as un-routed. Then Inventor asks for an auto-route of all un-routed wires. It then places all 19 wires into the predesigned harness, we guess by using closest entry and exit points. Then Inventor builds (and reports) a pin board payout of the harness showing the 3D derived wire lengths. The video below shows an Inventor user performing the test. SolidWorks takes a slightly different, albeit very similar approach. After importing the net-list, the operator builds a 3D representation of the harness and then places the wires into the harness, with the software computing the wire lengths. This took more manual interaction than the Inventor solution, but yielded the same end result. 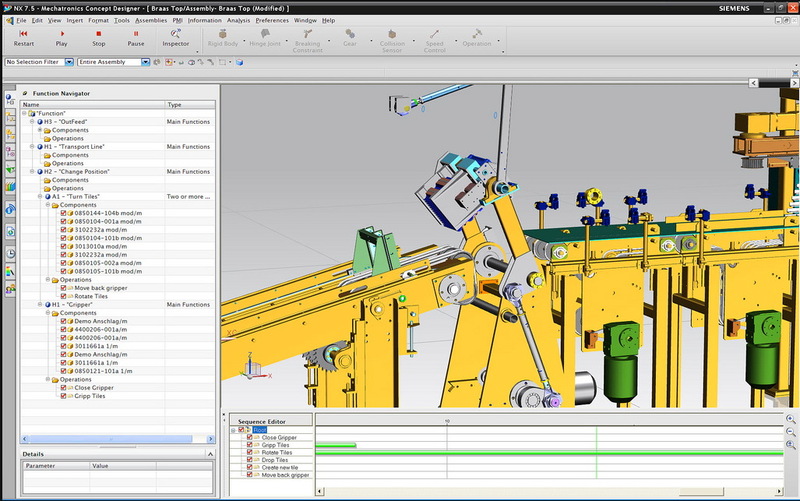 The video below shows a SolidWorks user performing the test. This is the final blog in this series. Users can review a summary of these tests, published as Part 1 of this series by clicking here. We have also published a pdf file of the complete report here. The pdf file does not contain any videos. To see them you have to revisit this blog series at raykurland.com. Raymond Kurland is president of TechniCom Group LLC and its principal consultant and editor. His firm, founded in 1989, specializes in analyzing MCAD and PLM systems and has been involved in reviewing and comparing such software since 1987. Ray frequently consults with both vendors and users. Ray has degrees in Engineering from Rutgers University and from NYU. His career included stints with Bell Telephone Laboratories, IBM, and Dassault Systemes. Ray can be reached at rayk@technicom.com. For more information about TechniCom Group and other software reviews please visit http://www.cad‑portal.com and Ray’s blog at www.raykurland.com. You can also follow Ray on twitter using the id technicom. Wow, driving back and forth from Boston to NJ really did me in. 500 miles in a few days, packed with several traffic jams from accidents, plus sitting in conferences for 2 days! So this blog may come to you a bit late. In the way of openness, Siemens paid for my travel expenses to and from the meeting as well as two nights at the hotel. Anyhow, on Day 2 of the conference (22 Sep), I had the opportunity to view Siemens already released (last week) Mechatronics Concept Designer (MCD) software – a terrific idea, and aptly suited for designers of complex machine tools, especially those machines or groups of machines with lots of parts in motion. Later in the day, Dan Staples, Solid Edge’s head of development, and original architect of ST, described what’s coming in their upcoming release of Synchronous Technology 3 (ST3). Built as a stand-alone solution, Paul Brown of Siemens, Senior Marketing Director, stated that the Price was about $20K, had no software prerequisites, and includes a copy of NX to assist in the design detailing. Shown in the image above is an example of a machine designed with MCD. Designed to work with NX and Teamcenter the idea is to map out a block diagram of the prospective machine, use a library of functional parts that can be re-used or designed, add requisite motions, and prove out the design concept. Then the concept design is passed on to the appropriate engineering disciplines to continue to add detail to the design. I really liked the concept, but there is too much detail to describe here. You can see more at http://www.plm.automation.siemens.com/en_us/about_us/press_kit/mechatronics-concept-designer.shtml. What is really appealing is that design concepts like this could only have been done before manually, and because of the complex interactions of 3D and motion, would have been very difficult to design and extremely error prone. One could easily imagine this technique used for other design projects. On the ST3 upcoming launch, due in mid-October, Solid Edge (SE), part of Siemens’ Velocity business unit, and headed up by Karsten Newbury (see my blog dated 22 July), continues to press the envelope by extending ST into assembly design, and allowing a mixture of history based design and ST unordered design. Incorporating some 2000 customer enhancements, ST3 should be an extraordinary release. The ST3 modeling advances also allow all of SE’ other apps, such as piping and wiring to use ST technology and auto update as changes are made. Got to get some sleep now. 22 Sep 2010: Yesterday Siemens PLM Software (SPLMS) kicked off its annual analyst conference in Boston, MA, following a years hiatus due to the economy in 2009. The transition to new President Chuck Grindstaff seems to be going smoothly. Surrounded by an experienced team of long time PLMers, Chuck is upbeat and feels confident about the transition. Long the technology strategist, he plans to continue as CTO, at least for a while. Following a “difficult year” in 2009, Siemens business is up more than 25% this year. The company trotted out a chart of their success, for example, in the auto industry, noting that 12 out of 15 of the top players now use Teamcenter, traditionally a Dassault Systemes (DS) stronghold. Not only that, but they are displacing DS’ V6 with NX in several accounts. Other top performing industries include aerospace and surprisingly, shipbuilding. Tony Affuso pointed out that being a part of Siemens helps enormously in winning large and very large accounts, because of company stability (120 years in business) and the synergy with other parts of the Industrial Automation Group. On the technology front, Teamcenter is expanding its offering rapidly into new applications. Notable among them is a new System Engineering application that now allows validating products based on customer requirements – one I have long awaited. Solid Edge ST3 is on the horizon. A pre announcement briefing is schedule for later today. Two customers spoke glowingly of its use. Mechatronics Concept Design was oft mentioned today as a new application about to be released. It combines a physics gaming engine along with a hew UI, allowing early concepts to tie together electrical and electronic system into early design. We are due to hear more later today and I will update my readers as I find out more about the technology. For many years I have been a lone voice in the woods imploring PLM vendors to make access to the reams of data easier. SPLMS shows the promise of delivering with HD-PLM. Not exactly sure about what is involved to make this work for each client, but Grindstaff intimated that it could be done with minimal efforts. Their goal is to provide clients access to the massive amounts of data so organizations can customize displays that make sense of often used data. For example, by displaying the graphic of a full car, and color-coding all late items red, a user can instantly see the project status. How about where it does not meets specs, or over cost, or needs work for fit and finish? Wow, this is exciting! Many customers spoke about their implementations, perhaps none so eloquently as Amy Gowder, Director of Performance Excellence of Lockheed Martin Aeronautics about their use of SPLMS software on the JSF program. Working with 3 major variants of the product and 10 international partners companies, they have so far avoided major fit issues as have plagued Airbus and Boeing. Gowder noted that their success is not based on software, but on changes to the ways they work. Wonder how I can get a flight in the Harrier replacement variant?